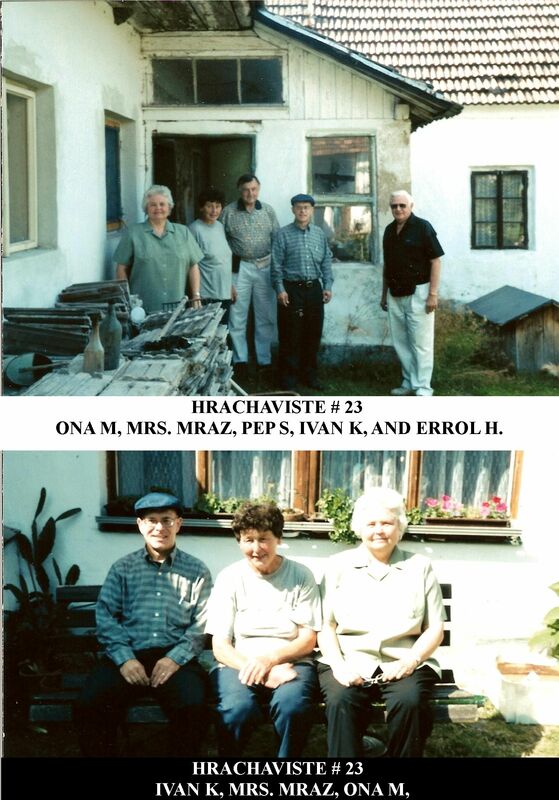 Our Trip to the Czech Republic, narrative by Shirley Hooper, photos by Ivan Katzenmeier and genealogical research by Jean Shanelec. Our Czech guide, Jana, met us all and boarded us on a large bus and introduced us to our driver, Frantisek. On the route into Prague from the northwest, we drove past Bila Hora, White Mountain, which is the site of the famous battle between the Roman Catholic Habsburgs and the protestant Hussite Czech Army on November 8, 1620. The Czech army was defeated, and Bohemia became a de facto province of Austria. Since our rooms were not yet ready, she took us on a long walking tour of part of Prague. 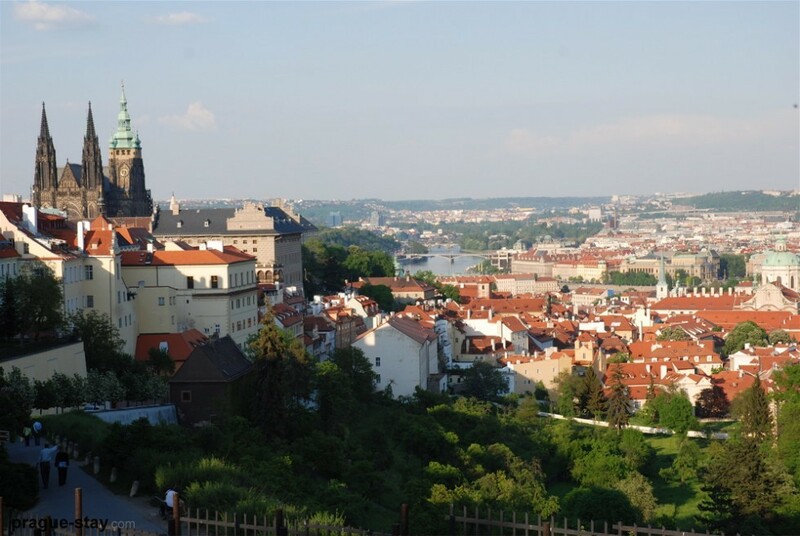 Part of the walk took us to the 800 years old Strahov Premonstrate Monastery (Strahovsky Klaster) and we were able to have our first beautiful panoramic view of Prague. 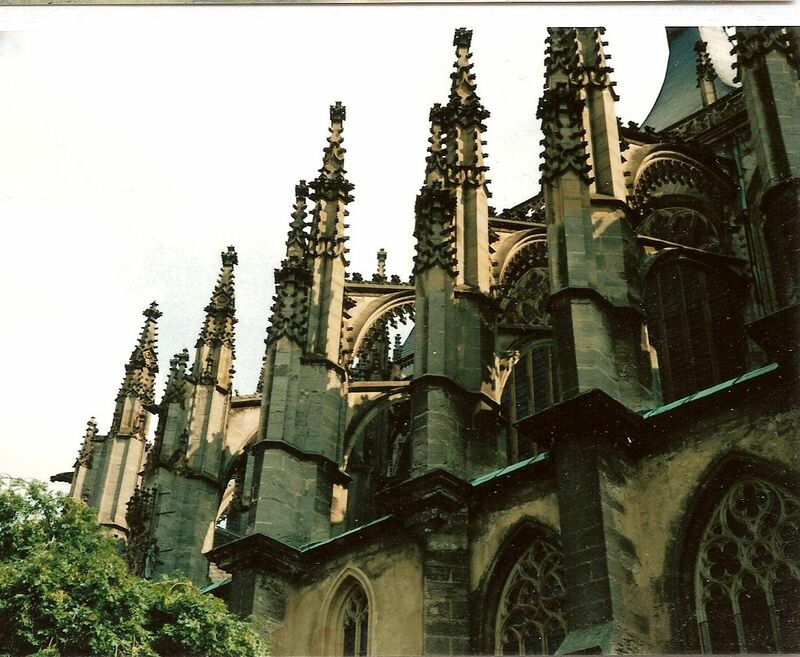 It was a vast sea of red roofs and quite a site with all the spires from the different cathedrals, etc. 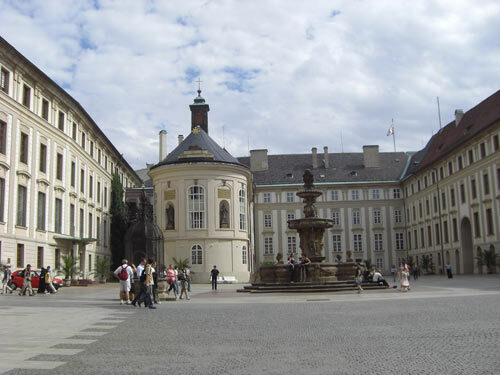 From there we walked to a beautiful court yard and on to the Presidential Palace ( Prague Castle and Hradcany). We saw the palace guards march by and also the guards walking for the change of the guard. They are quite a sight, about five of them walk in a straight line and keep time with their rifle butts striking the cobble stones in rhythm. We walked through the courtyard to the palace and out on a bridge that is over an old moat. As we were standing on the bridge, some one said, ‘here comes the President (Vaclav Havel).’ We were able to get a picture of his car as they drove past. Only three cars in the motorcade. Jana told us that the President lived in the Castle before the Communists took over in 1950, but the President now lives in his own house somewhere else in Prague and works in the castle. They also receive foreign dignitaries there. We were finally taken to our hotel where we got our very nice rooms. The only thing missing in the European Hotels are wash cloths. You must bring your own. At 1:30, we were back on the bus for a trip downtown to the National Archives for a lecture on Genealogy. They explained how they keep their records and how researchers can look up someone’s ancestry and know exactly where they lived, were christened and where they migrated. We then went back to the hotel to prepare for the two and half hour dinner cruise up the Vltava River. 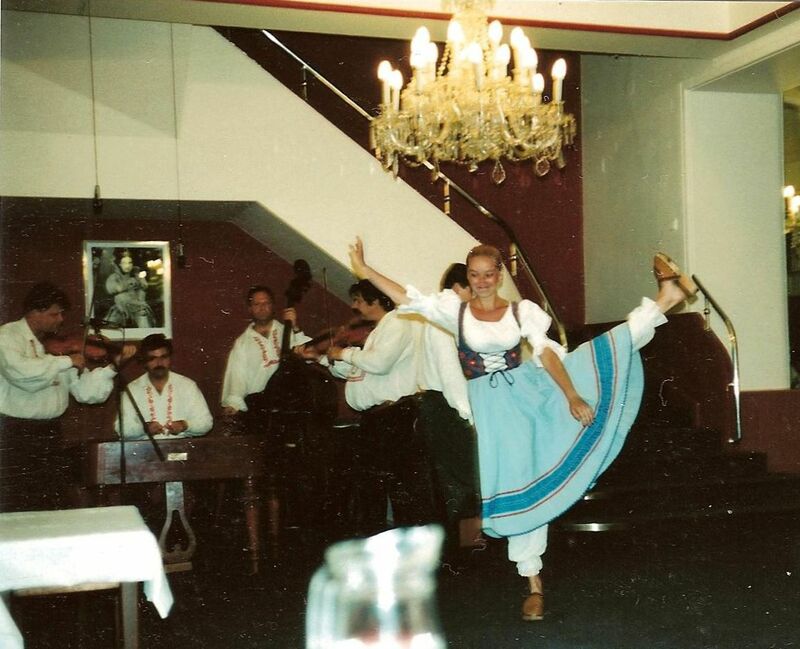 This was our initiation to the wonderful Czech buffet and entertainment. This time the entertainment consisted of accordion music. the ship, we were able to see a wonderful view of Prague. We went under the St. Charles bridge, and could see many historical buildings and cathedrals on the shore. 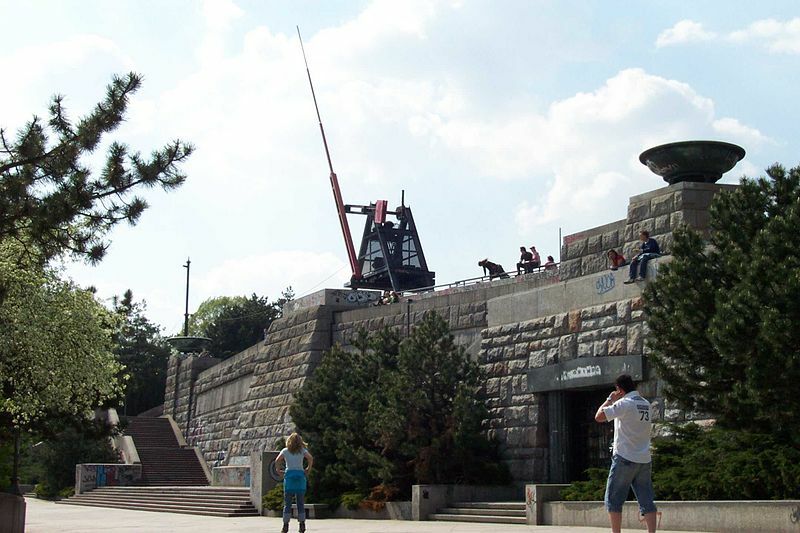 On the skyline is a large metronome, which was constructed on 1991. It is lit up at night and makes a striking image against the night sky. 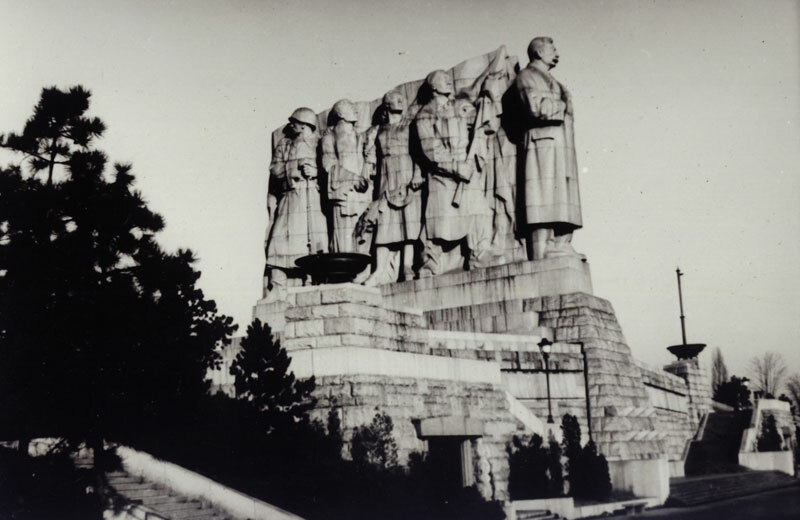 It was built on the site of a gigantic statue of Stalin, which was blown up in 1961. Then it was back to the hotel for a good night’s rest. After a huge buffet breakfast at 6:30 A.M., we boarded the bus for Straznice via Brno, the second most important city in Czech Republic. On the way to Straznice we visited the Moravsky Kras caves, at Punkevni. This area is called the Moravian Karst, which is a beautiful heavily wooded hilly area north of Brno, carved with canyons and honeycombed with some 400 caves, created by the underground Punkva River. Groups of 75 people are admitted to the caves every 20 minutes. We walked 1km (.6 mile) through the deepest caves, admiring the stalactites and stalagmites, ending up at the foot of the Macocha Abyss. There we boarded a small boat for a 400-meter ride down the Punkva River out of the cave. Traces of prehistoric humans have been found in the caves. Punkva cave stalagmites in the Masaryk Dome. Boat ride on the 40 meter deep underground river Punkva, exiting the Moravian Karst cave. Took a tram up to the top of the Mt. and then on up to the top of a tower via elevator or stairs. We had a great view of the city. we visited Moravsky Krumlov castle which housed the gallery of the Mucha’s giant paintings “Slovanic Epopej”. These paintings were about 24 feet square and depicted a story of the Slovic life and history. The guide was very soft spoken and it was difficult to understand what she said, but the paintings were beautiful. We weren’t allowed to take pictures. These photos are from the internet. From the castle we continued on to Uherske Hradiste for our hotel and dinner of pork tenderloin, shredded cabbage, carrots and unique potato patties. We went to the opening night dances at the Czech festival in Straznice. They were very interesting and quite colorful. Wonderful for photos. We returned to the hotel about 11:30 P.M. Very tired after such a long day. Up early for another buffet breakfast then off for the Festival via visiting another huge Lichtenstein castle in Lednice. The Lichtensteins, at first a poor but belligerent family of Austrian origin, enlarged their domain by diplomatic skill, and war-services, by taking full advantage of the confiscations after the Battle of the White Mountain and by conscious economic policy. 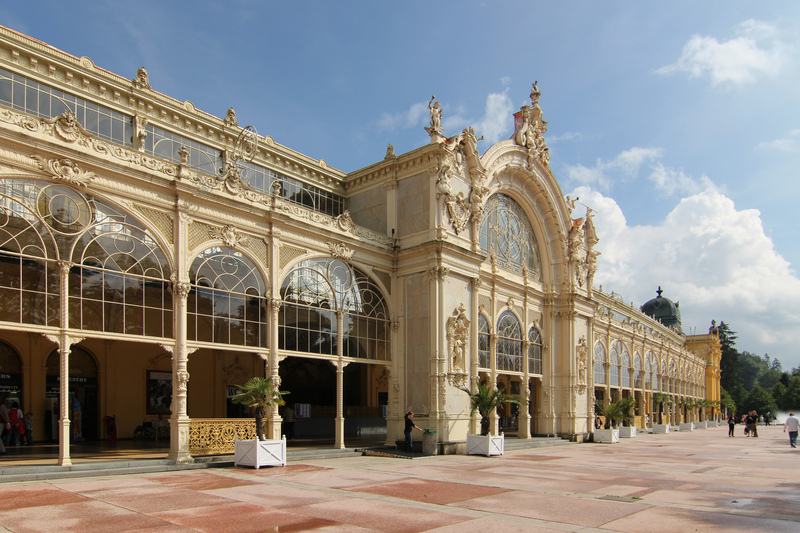 Lednice has been the property of this family until the end of the second world war, with the exception of a five-year interval in the 16th century. 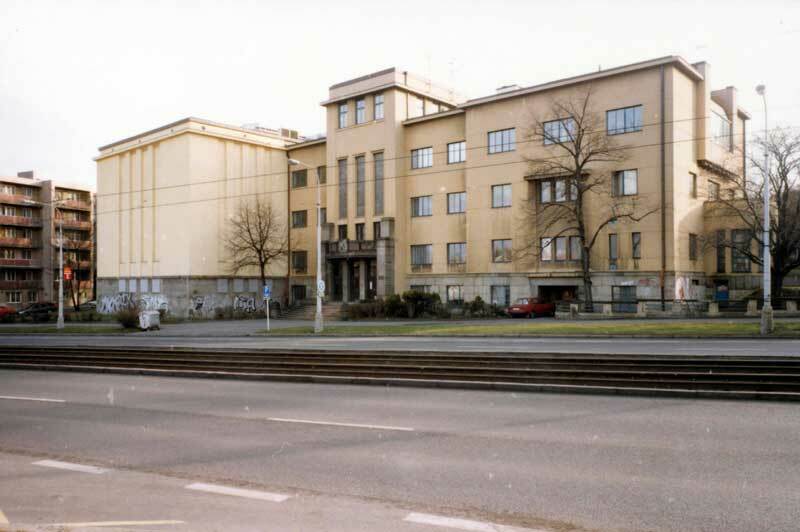 At the end of World War II, this property was confiscated by the state, because of the family’s cooperation with the Nazis. They are suing the government for the return of their property. 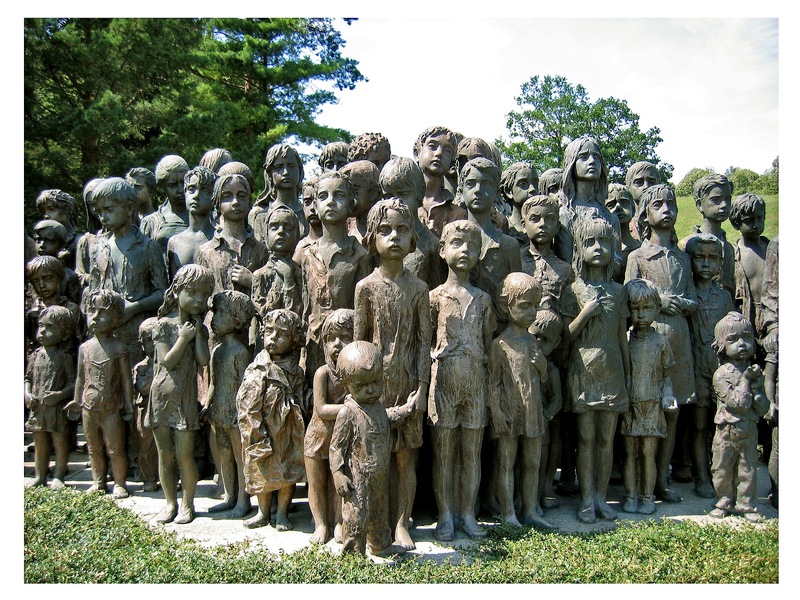 After the communists lost power, all property that was confiscated by the communist government was returned to the prior owners, except for those families who cooperated with the Nazis. This castle appeared to me more like a huge palace with court yard and beautiful gardens, etc. The large rooms inside were covered with beautiful oak carvings covering the walls and ceilings. It is famous for the beautiful free standing spiral staircase that is suppose to be made from one oak tree. It goes from the ground floor up to the second floor. It is pretty much restored on the inside, but the out side still looks very run down. All buildings, etc. in the Czech Republic look very run down as everything was let go during the 40 years of Communist’s rule. They are in the process of trying to restore all public buildings and are doing a good job, but they are so massive that it takes a long time. Visited the gift shop briefly and the toilet. It costs 7 Crowns (less than 20 cents) to use their toilet facilities. 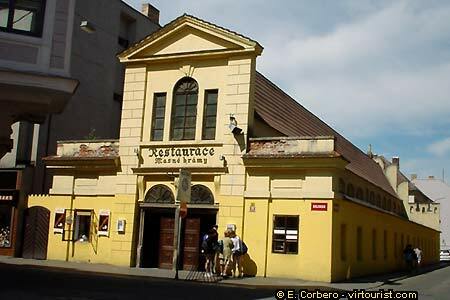 Then it was back to Straznice for the festival. Everyone was dressed in their native costume representing their district or area. We went to the different arenas and listened to the music and saw the different cultural dances. At 3:00 we went to the town square for the parade. That was very colorful as well. Ivan, Larry and Ona skipped the parade and attended a pavilion that featured the Czech dance finals, which was quite a show. and to a wine tasting event, which included cheese, pretzels, and rye bread and accordion music. It was interesting to see how they store their wine. 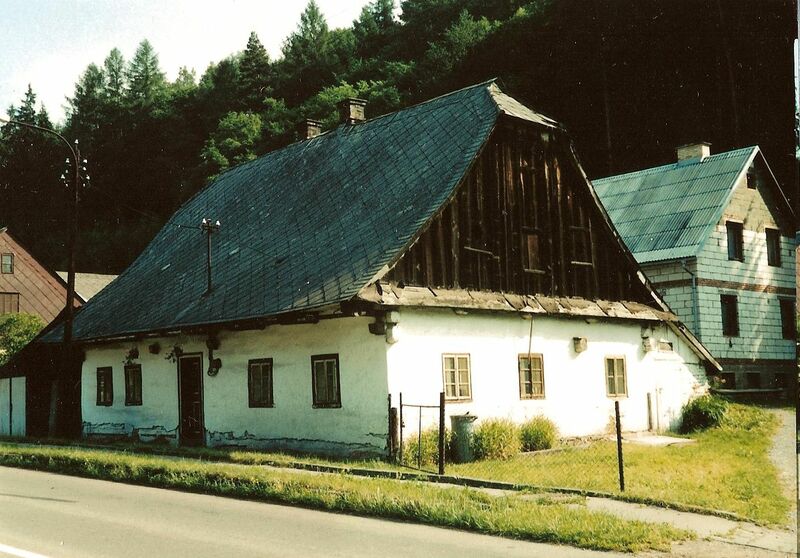 (3km south-west of Straznice) the cellars are partially underground; in Vlcnov they are more like huts. 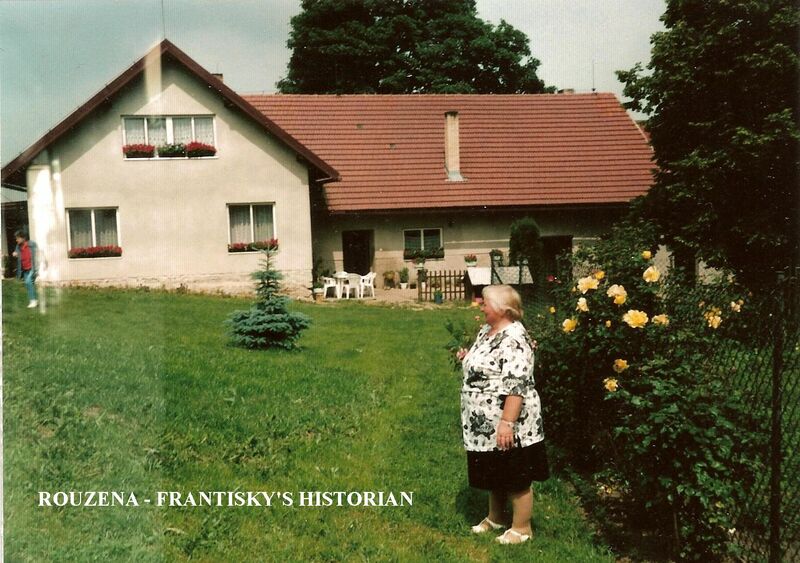 At Prusanky, 8km west of Hodonin, the wine cellars constitute virtually a separate village. Then, it was back to the hotel after another late night. We all were quite tired by then. Another large breakfast buffet at the Hotel Grand in Uherske Hradiste, then boarded the bus for the final part of the festival at Straznice. 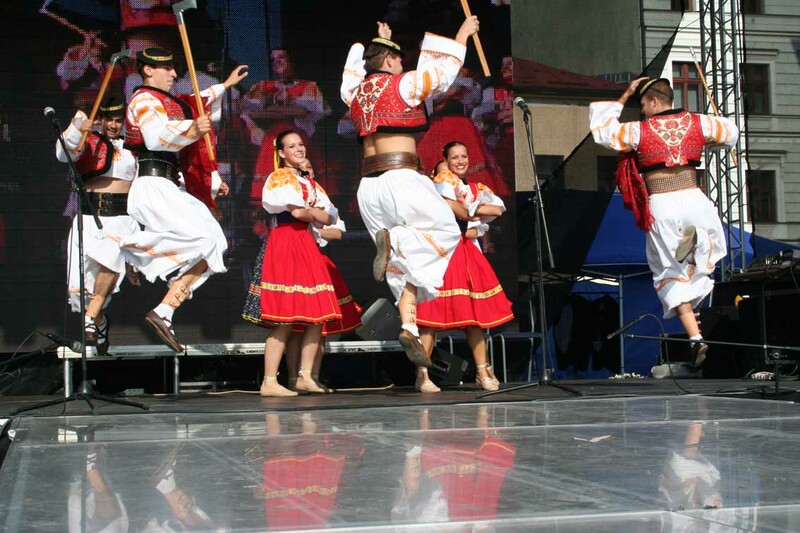 In the festival pavillion were non Czech entertainers, such as the Gypsys and other ethnic groups performing their traditional songs and dances. The festival went on all day, but we had to leave by noon and go on to CESKE BUDEJOVIC with a stopover in TELC to see the local Renaissance chateau and on to the village of KOJAKOVIC. We visited Telc, which lies at the midpoint of the old King’s route from Vienna to Prague. It is the best preserved Renaissance town north of the Alps and was recently added to the UNESCO list of international heritage sights. We walked through a tiny arch and there it was, the Telc square in all its magnificence! 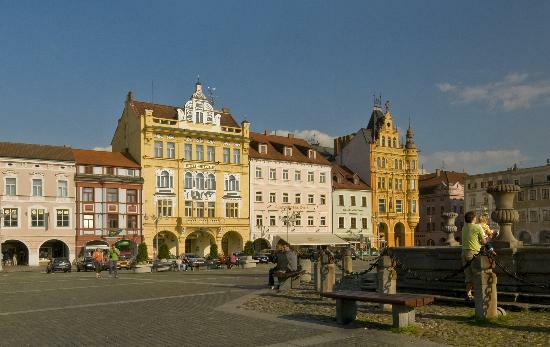 Telc is an architectural and artistic ensemble of exceptional quality. Its triangular marketplace also possesses rich cultural importance because it is surrounded by intact or well-preserved Renaissance buildings with a striking array of facades. At the end of the Middle Ages in Central Europe, planned communities were established in the midst of regions of complete forest for reasons of political control and economic expansion; Telc is one of the best surviving examples of this tradition. Next we visited The Kojakovice Peasant Museum and Information Center, in Kojakovice. 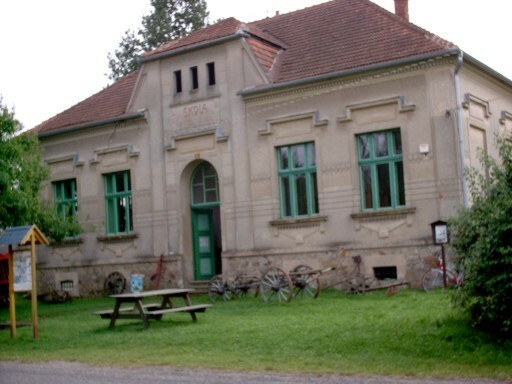 The museum focuses on how the farmers and peasants lived and worked in previous centuries in this rural part of South Bohemia, of which Kojakovice is a typical example. Ultimately, the museum will include traditional working and living places like old farmhouses, a blacksmith shop, and a school. 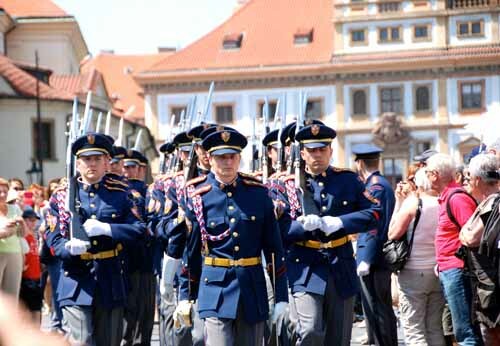 Initially, the exhibitions focus on the period around the Revolution of 1848 till the first World War (1914-1918), when the Czech lands were still part of the Austro-Hungarian Empire. The revolution was suppressed, but the Empire had to concede many concessions, including abolishing serfdom and allowing larger personal freedom. Its impact is shown most strikingly in the large numbers of Czechs emigrating to America. See below for more on this subject. 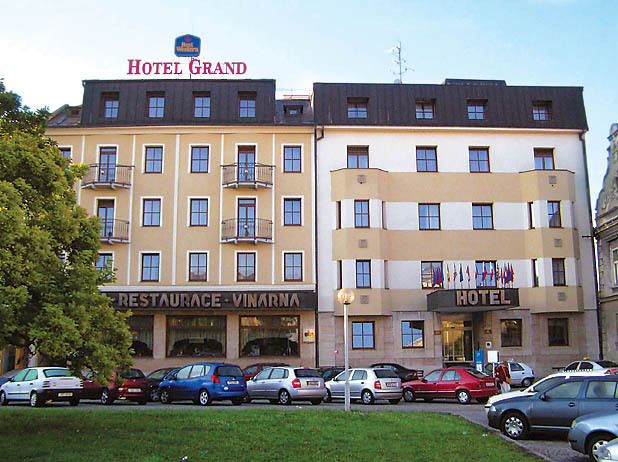 Our hotel was the beautiful Grande Zvon in Ceske Budejovice (Bud Weiser) overlooking a beautiful courtyard and fountain. All the buildings were on a square and quite colorful. Many are newly restored and some are in the process. 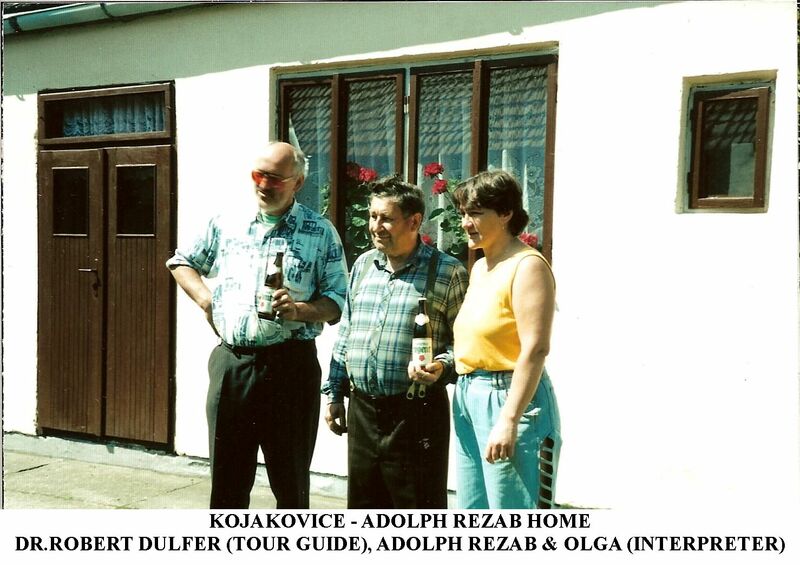 After a breakfast in the hotel, we got in a van and car with Robert Dulfer and his friend Olga to go to Jilovice, Lipnice, and other villages to visit the ancestral villages of the Rezab and Lilak families. The villages houses were small with red roofs. 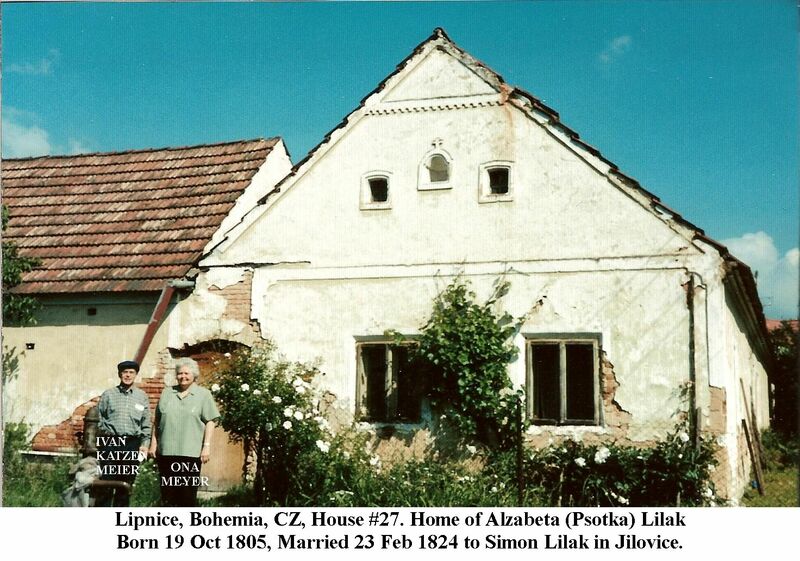 Our first stop was at what is considered the Lilak village, Lipnice #27 where Alzbeta Psotka was born on October 19, 1805. 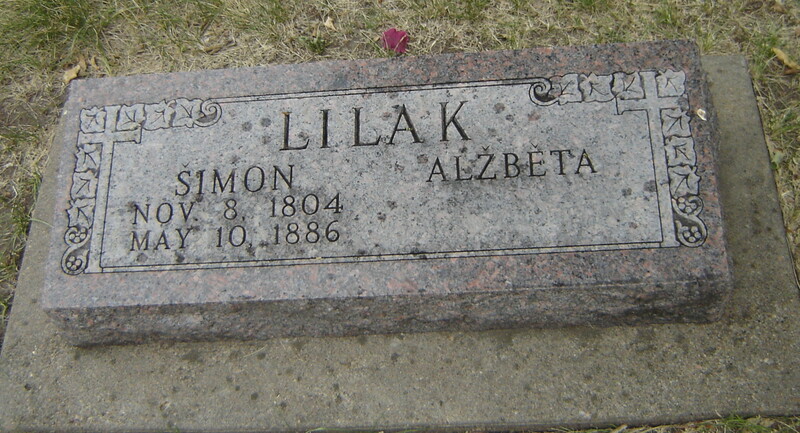 She married Simon Lilak in Jilovice on February 23, 1824. They are buried in the Wilson Cemetery, Wilson, Kansas. 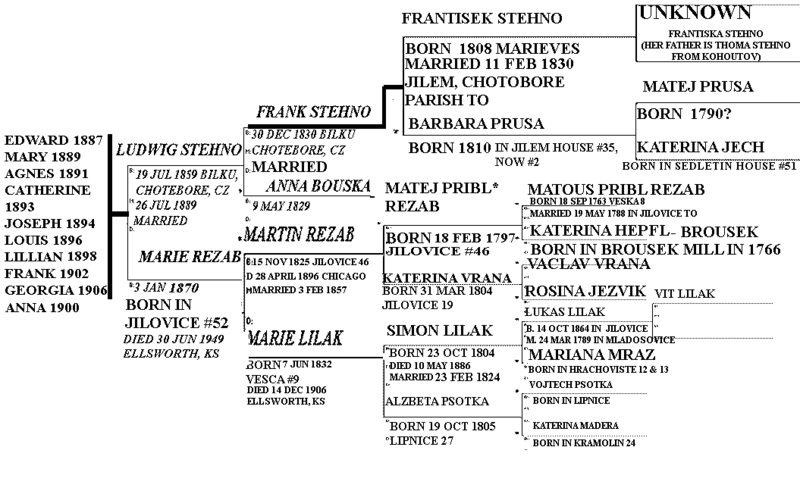 The Lilaks and Klemas are related to the Stehnos by marriage. Ludvig Stehno, married Marie Rezab, daughter of John Rezab and Marie Lilak. Marie is the daughter of Simon and Alzebeta (Psotka) Lilak. Agnes Stehno married John Klema. CLICK CHART TO ENLARGE. The building has not been restored. A man was there who went into the house. We didn’t get to talk to him. At the back of the house was the remains of an old horse drawn sleigh that would have been used in the snow. 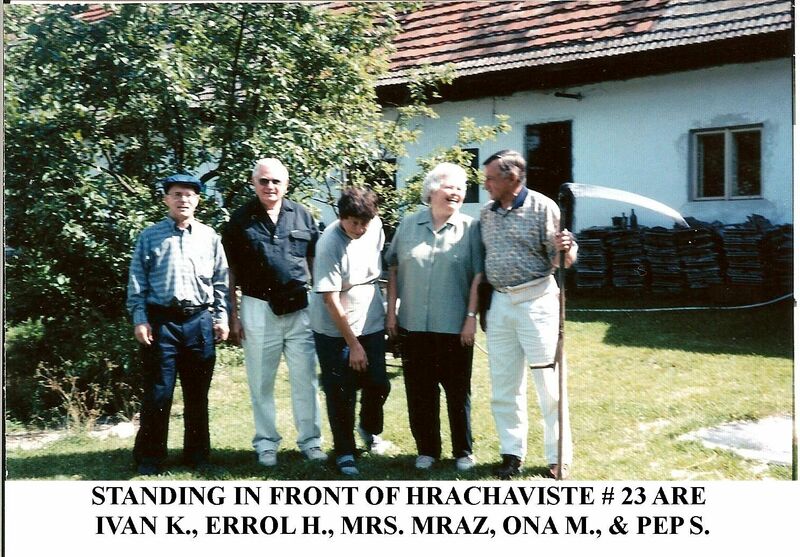 We then went on to Hrachoviste #23, home of Mariana Mraz, born about 1709 mother of Simon Lilak. She married Lukas Lilak in Mladosovic, March 24, 1789. He later died circa 1843 in Veska No. 9. It is located in a beautiful village and a direct descendant of the original family is living there. We visited with her and took pictures of all the cousins together. She had an original scythe there and they all had to have their picture taken with IT. The house originally built in 1785 has been restored and is lovely. It has a nice court yard in the middle as it is built on a square with the barn attached, etc. There was a pretty flower garden in the front of the house. Next, it was on to the Kojackovice village and the Rozenberk Society Immigrant museum, founded by Robert, Olga and other supporters. They are restoring an old school house and are providing two computers for students to work with. We were introduced to the mayor of the town and a city councilman. She showed us some ledgers that had the Rezab name in it and we took pictures of her and the councilman in the city hall. From there we visited with Adolph Rezab in this home. Adolph and his wife were quite excited to welcome us, although they didn’t know we were coming. They invited us into their beautiful courtyard and served us orange and raspberry soda. Their place is also built on a square with the barn, wood shop, and machine shop on the far end. There were some little chicks there in the barn that kept getting out and Mrs. Rezab kept shooing them back in. Mr. Rezab said he would have entered his father’s vocation as a carpenter, but the Communists made him work in a brewery. He made the famous Pilsner Urquell beer (they say is better than the Budweiser Beer). He showed us a book that he is keeping records in. I have a picture and the first page although I can’t read the date, but I thought he said it started in 1575 or there about. From there we went to the Rezab’s church in Jilovice, where Marie Rezab would have been baptised. It was beautifully decorated and smelled of roses when we went in, as there were so many bouquets of them sitting at the altars. Olga told us the building dated back to the 1300’s and under the wooden floor you could see the old concrete or rock floor. The present building was built in the 1600’s. The gardeners were mowing the grass outside with their mower that looks like two weed eaters on wheels. It made an interesting picture as well. Visited the birthplace of Marianna [Marie] Rezab. The house number 53 in Vesca. Errol H, Ivan K, Pep S, and Ona M.
Visited in Tesinov and the Rezab family home which dates back to 1534. It has been restored by some people from Prague. 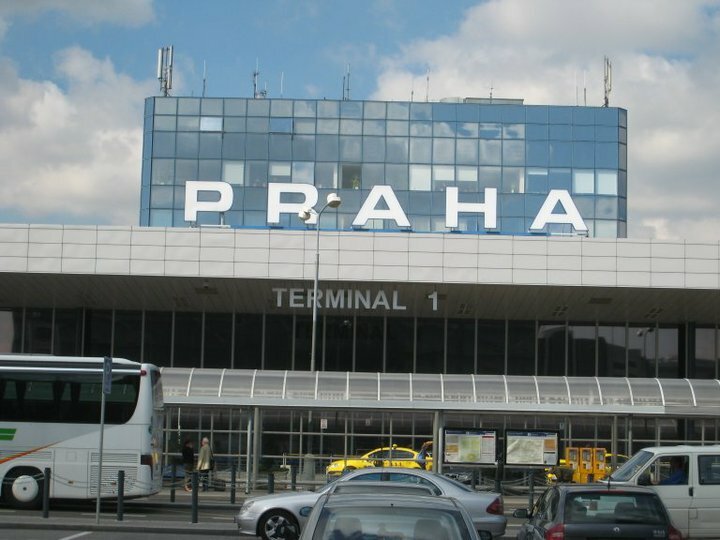 People from Prague like to come to the country for a summer home. There is a creek in the back of the house that Robert said would have had a mill on it. There are no sign of the mill today. 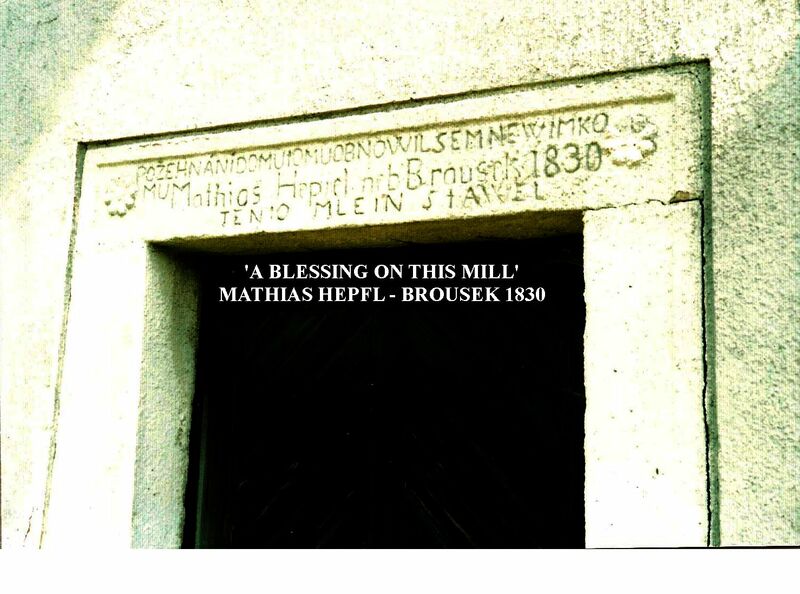 We also stopped at the Brousek mill and took pictures. As we were driving around to some of the Rezab houses we would pass by some large ponds that Robert explained were for raising their famous carp. Each year at the appropriate time they pull the plug at the bottom and drain the pond. It makes it easier to gather in the carp. They start over the next year. They have been doing it this way for centuries. On the way back to our hotel, Robert took us to the famous walled city of Cesky Krumlov. Cesky Krumlov is the largest castle complex in central Europe. 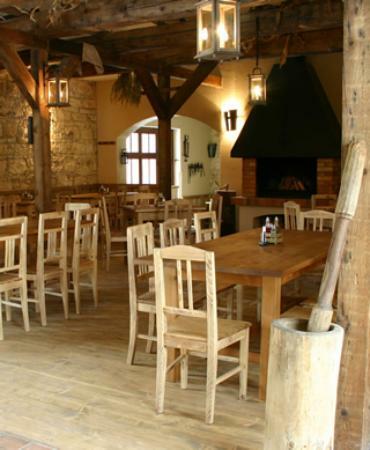 Dating back to the 13th century., it hovers over a charming, medieval town on the banks of the Vltava river. The entire town and the castle are under UNESCO protection. 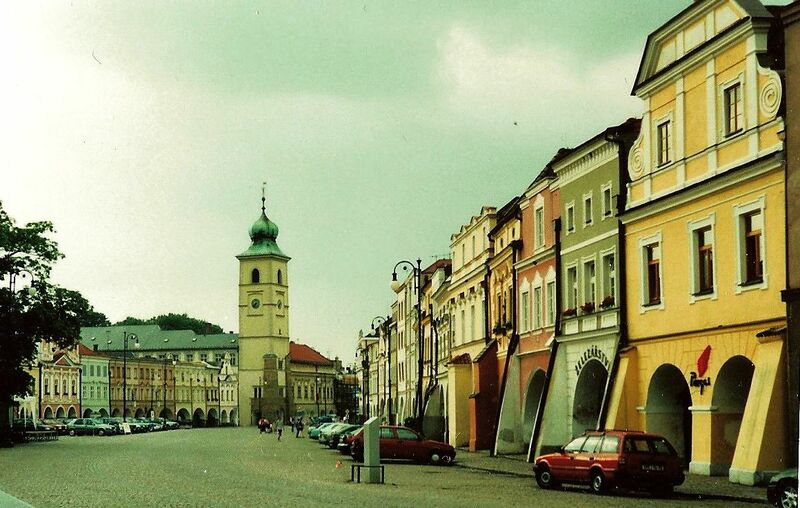 It is only 35 minutes south by bus from Ceske Budejovice. Ceske Budejovice, lying at the confluence of the Rivers Vltava and Malse, was founded in 1265 by order of King Premysl Otakar II and was undoubtedly expected to provide strong support for royal power in this region. Cesky Krumlov’s Old Town is almost encircled by the River Vltava, Cesky Krumlov is a jewel of historical architecture in Southern Bohemia. Known as Krumau in German, the name of the town comes from the German for a place on a crooked meadow, and the first written reference to the town in 1253 refers to it as Chrumbenouwe. 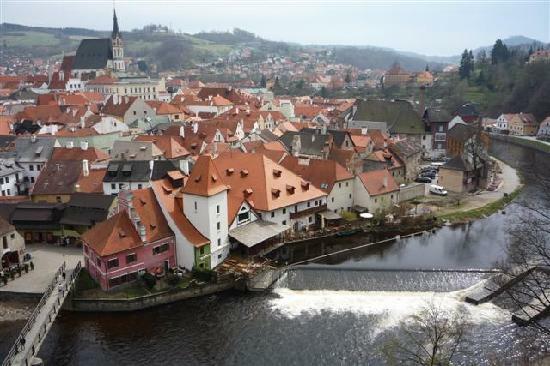 The Cesky (Czech for Czech) part was added in the 15th century. Lying close to the Germany and Austria, the town was always a mix of German and Czech residents, until 1938, when the Germans occupied the area, and then 1945, when the German residents were forced to leave. The year 1302 was to be a major turning point for the town. This was the year that the Rozmberk family of nobility came into possession of the town, and bestowed upon it the benefits only a powerful family could bring. The town received certain privileges, buildings were built, commerce and culture flourished, and the town grew in importance. The town’s architecture still reflects this period of affluence, especially in its Renaissance buildings. In 1494, the town was even granted Royal status. The Latran quarter, which includes the castle, and the inner Old Town, were joined together in 1555 by Vilem of Rozmberk. 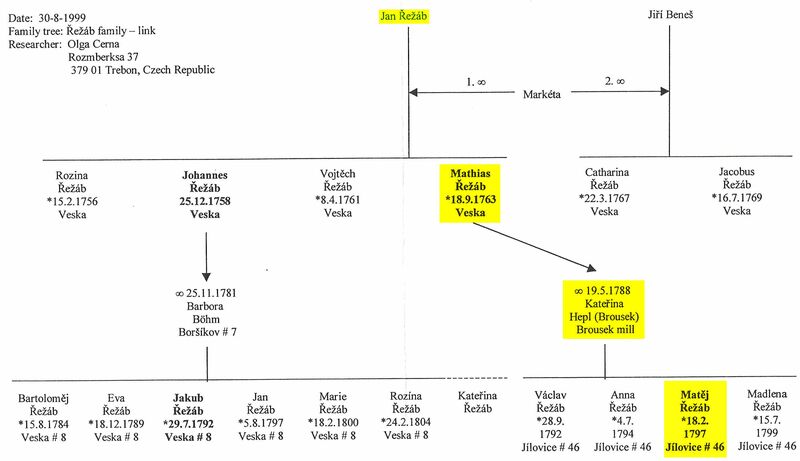 But this period would come to an end in 1602, when the aging Peter Vok of the Rozmberks was forced to sell off the Cesky Krumlov estate to the Emperor, Rudolph II. This meant that the town was no longer the seat of its overlord, and it fell into the status of backwater again. Soon after, in 1613, the town was taken when troops from nearby Passau in Germany invaded Bohemia, and then, of course, came the Thirty Years’ War. The town was occupied first by Imperial forces, then Bavarian, and then in 1648, Swedish, and all the money spent to keep the town from being razed to the ground over the years left it financially ruined. The town passed to the Eggenberk family in 1622, and then to the more powerful Schwarzenberks in 1719, who also made the town their seat. Though the town didn’t prosper as much under their rule, but there was still some construction completed. Much of this took place in the castle, which was built into the second largest in Bohemia, behind only that in Prague. We strolled through part of the city, mostly “shops and tourists traps” and took the steep walk up through the castle, etc. We were ready to head to the hotel by then, but had to stop by the restaurant, Masne Kramy, for our dinner: pork, loaf style and carp for the appetizer. They had a wonderful dumpling with a berry sauce and whipped cream for dessert. We walked back to the hotel. Today we left for West Bohemia via Pisek and Domazlice where we visited the famous church in Lomecek. This church was out in the country and run by about 25 nuns. It was quite ornate on the inside. 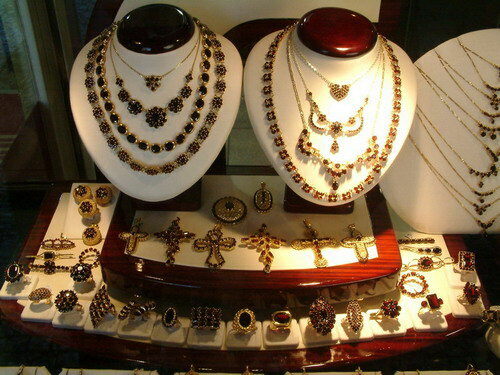 Many of the carved figurines were of wood made to look like gold. It had been left in ruins after the Communists rule of 40 years, but they are getting it all restored. The nuns had been put in prison for part of the time that the Communists were in power. At Pisek, we briefly visited the stone bridge The oldest remaining bridge in the country, it was evidently built before the end of the 13th century. It is 111 meters long and had defense towers on both banks, which have not been preserved. The bridge is decorated with statues of St. John of Nepomuk, St. Anne, St. Anthony of Padua and the Christ crucifixion. The bridge is part of the national heritage. We stopped in the spa town of Marianske Lazne and bought the special kind of mugs that are used for drinking the spa mineral waters. The musical fountain went off at 5:00 P.M.
After the show we boarded the bus for the Monastery in Tepla where we would spend the night at the hotel Klasterni Hospic. The old huge barn has been converted into a hotel. Our room was up in the loft section. It was quite quaint and interesting. We toured the church and library of the Monastery. Most of the Monastery is in a very run down condition, but is slowly being restored. There are 18 of the original monks still living there. 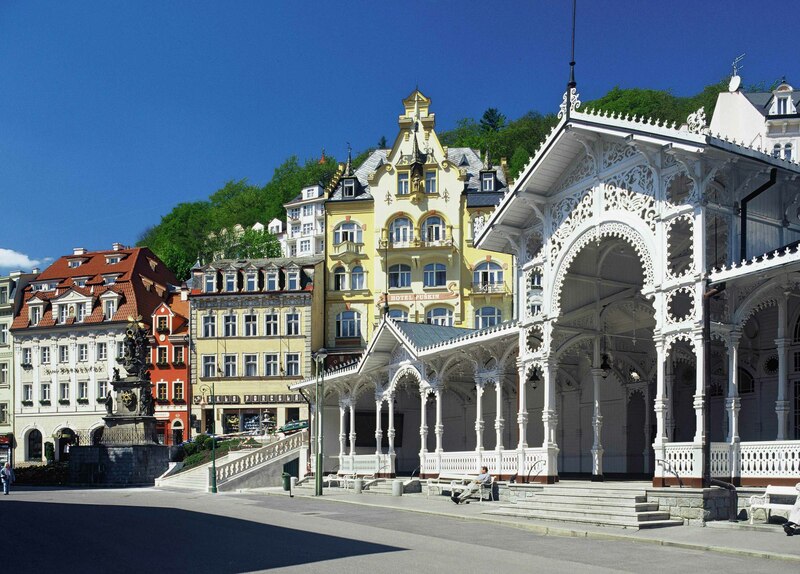 From there we toured the spa city of Karlovy Vary (German name, Karlsbad). We walked to the many different mineral waters and tasted each. They are at varying degrees of temperature and are suppose to be good for different parts of the body; such as, the liver, stomach, etc. It is the most famous Bohemian spa. It was named for the Bohemian king and German and Holy Roman emperor Charles (Karl) IV who allegedly found the springs in 1358 during a hunting expedition. In the 19th century, royalty came here from all over Europe for treatment. 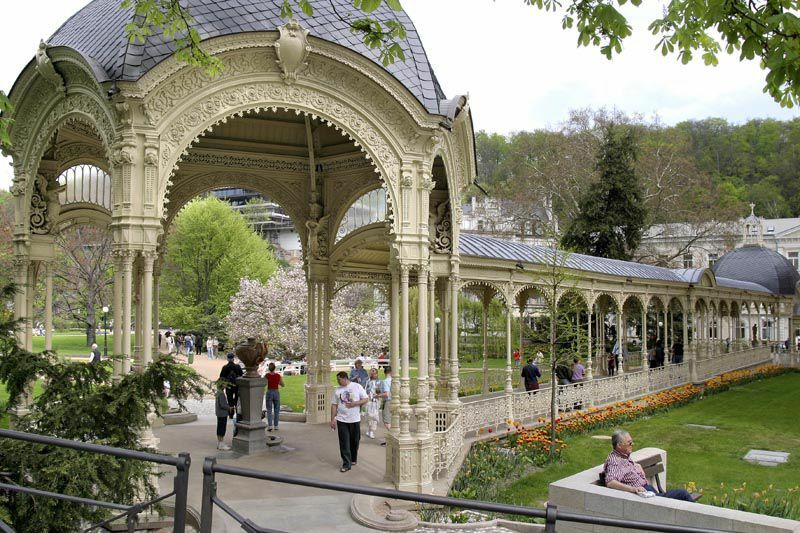 Among the rich and famous who visited Karlsbad are Goethe, Schiller, Beethoven, Chopin, and Karl Marx. Based on what we saw, a lot has been done to renovate many of the buildings. The river entering the hot springs creates fog. The spring shoots 40 feet into the air. The communists built the Yuri Gagarin Colonnade for it, a rather ugly modern structure. More than 60 hot springs have been found here and 12 are used in spa treatment. The springs, which vary in temperature from 34 to 73 degrees C, are used in drinking cures and for baths. There are some interesting buildings on the hillside above the river. On the plateau called Peter’s Height. Peter the Great is said to have carved his initials in a wooden cross on the hill. The facades of most of the houses are decorated with stucco. 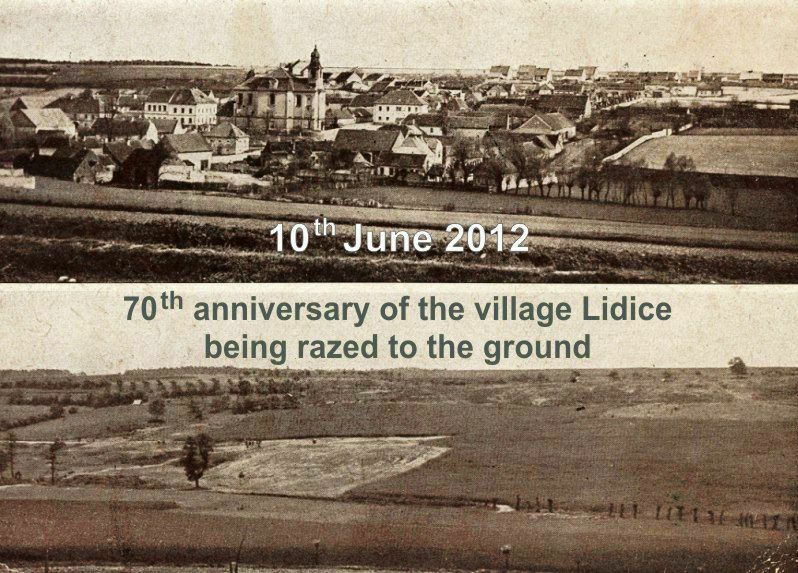 We visited the Ledice Memorial, the site of the former village of Ledice, where all of the men, 15 years of age and older were murdered and the women and children were sent to death camps, in 1942, by the Nazis in retribution for the assassination of the Nazi governor of Bohemia, Reinhard Heydrich, whose sadistic and brutal reputation was unrivaled among the Nazi leadership. All the buildings, including the houses, churches, etc. were destroyed by the Nazis. A visitor’s center at the site presents a movie of the act and pictures of the men and women who lost their lives. In the morning, we went on a half day city tour of Prague including old town and the Prague Castle. 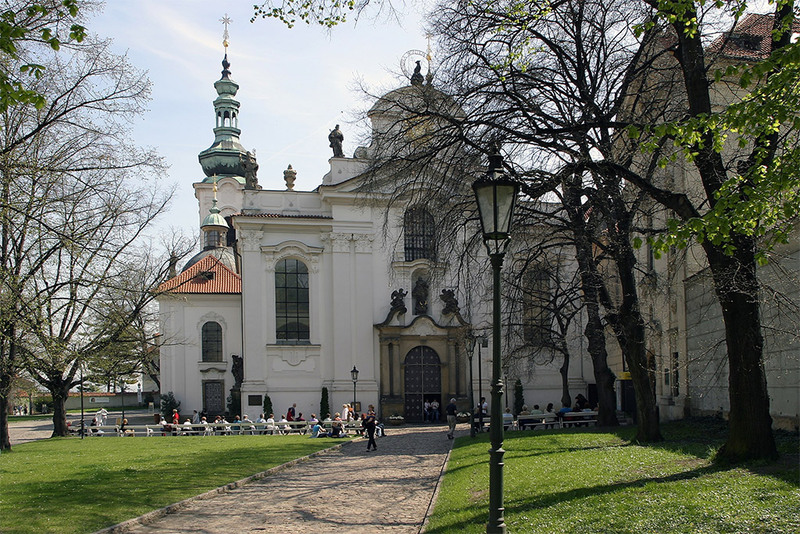 On the grounds of Prague Castle is a cathedral called St. Vitus Cathedral, which we walked through. 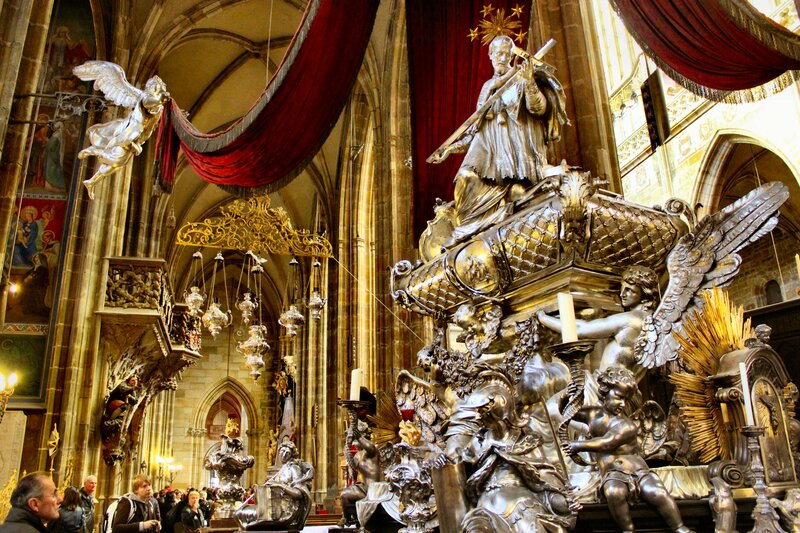 The cathedral has the remains of many historical figures, such as the tomb St Wenceslas, the royal mausoleum of Ferdinand I who died in 1564, St. John Nepomuk’s tomb crafted of solid silver, and the royal tomb of Charles IV. In the afternoon we traveled to the Castle of Sychrov. 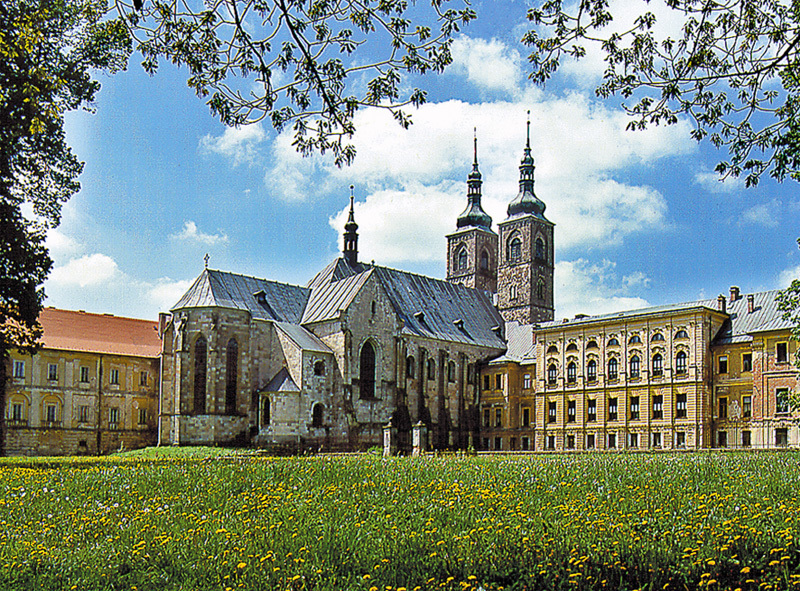 is located in north-eastern part of Bohemia. The building has the shape of closed tetragon. It was owned by the Rohan family. 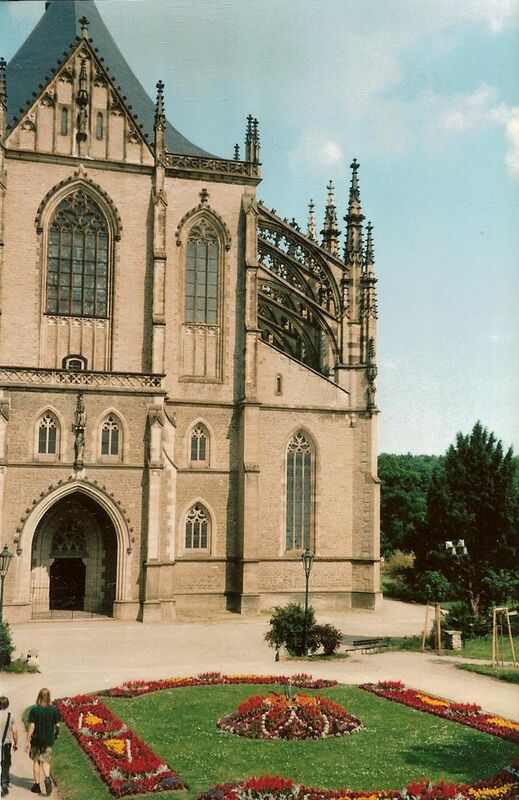 It was reconstructed in 19th century in romantic gothic style. The interior also reflects the form of the second half of 19th century. Composers Antönin Dvorak and Josef Suk often stayed in the castle. Sychrov is also surrounded by beautiful and large English park. 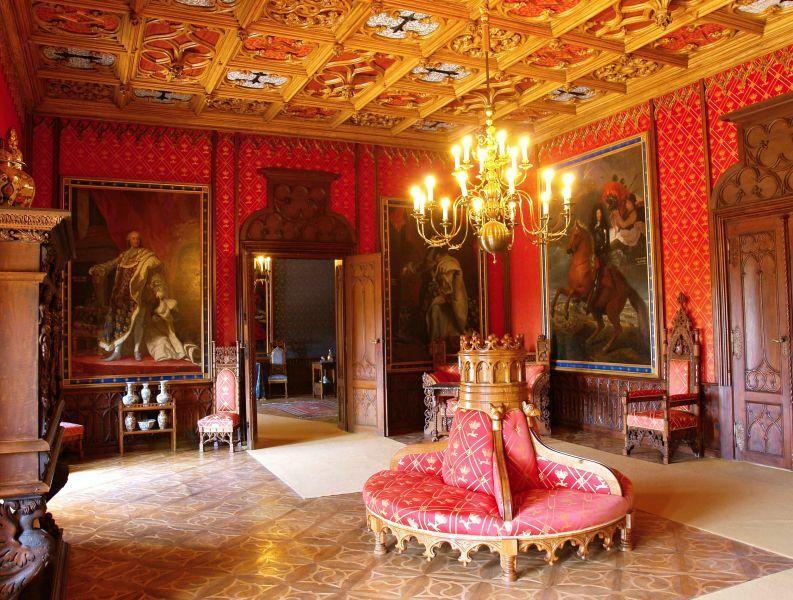 The castle’s interiors are decorated by well-known miniaturist Jan Zacharias Onast, sculptor Emanuel Max or painter Josef Hellich. 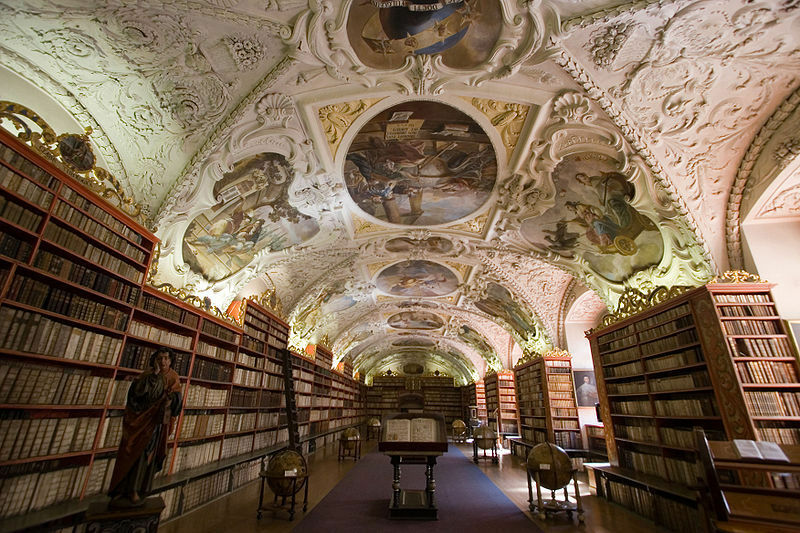 On the walls and ceilings are richly carved veneers (by Petr Busek) – especially remarkable is the carved ceiling in castle dining-room and also a library which contains over 7000 volumes stored in carved cases. Very famous is a collection of oil-paintings – it is a biggest collection of portraits in Middle Europe. Also there are interesting collections are those of porcelain and glass. 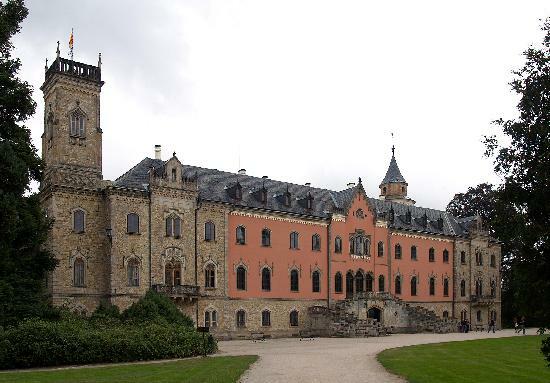 As a reminder of Antonin Dvorak who often visited the castle there was established a little museum of him. 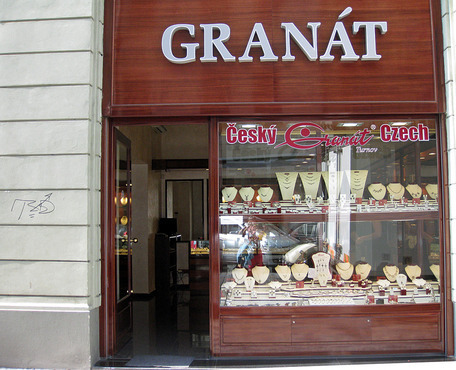 Then we traveled to Turnov for a visit or buying time at the Garnet factory. 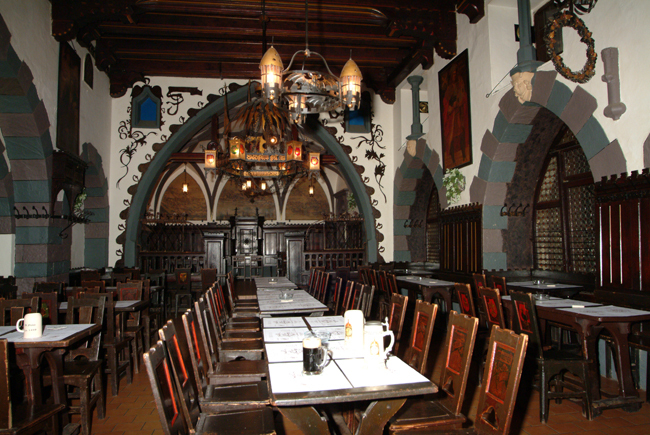 In the evening we returned to Prague for a Dinner that night in the Brewery Hall U Fleku, which is the oldest in Prague. It seats 1200 people. Music was provided with the accordion and an unusual instrument. Traveled in a van to villages of the Stehno & Bouska ancestors of Ludvig Stehno: Frantisky, Bilek, Chotebor and Marieves. 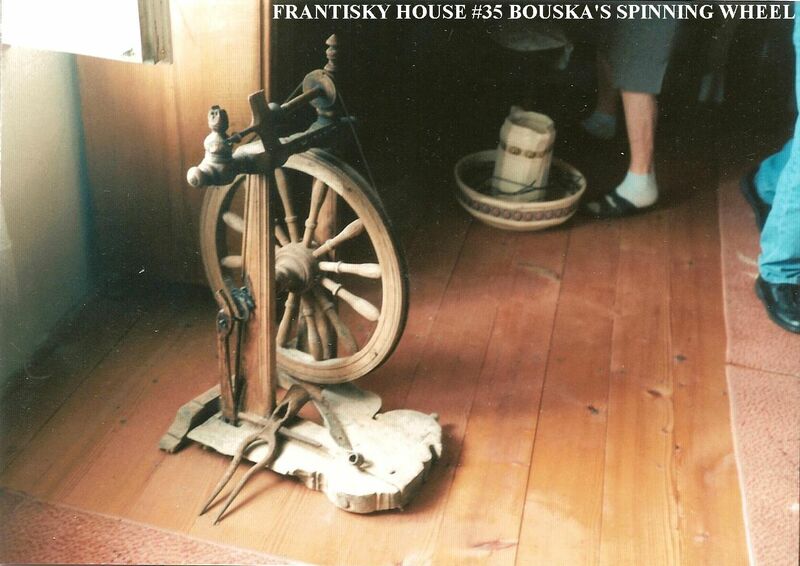 Went to Frantisky where all the Bouskas lived. Met first with Ruzena Tepla, one of the three permanent residents of Frantisky. She acted as our hostess, serving us coffee, then took us to the different houses. They are spread quite a ways apart. The farmers were cutting and stacking hay. Some were baling it. 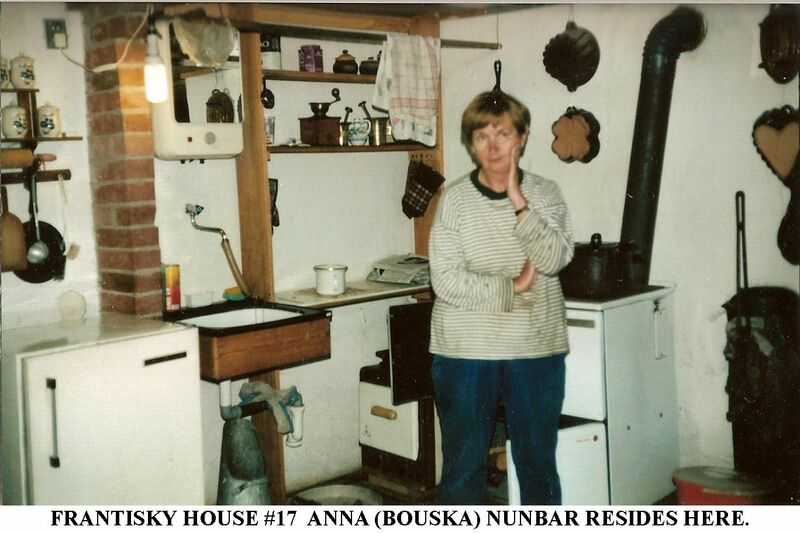 SEE CHART ABOVE FOR ANNA BOUSKA WHO WAS BORN IN FRANTISKY HOUSE #35 IN 9 MAY1829, AFTER HER PARENTS MOVED HERE IN 1822. 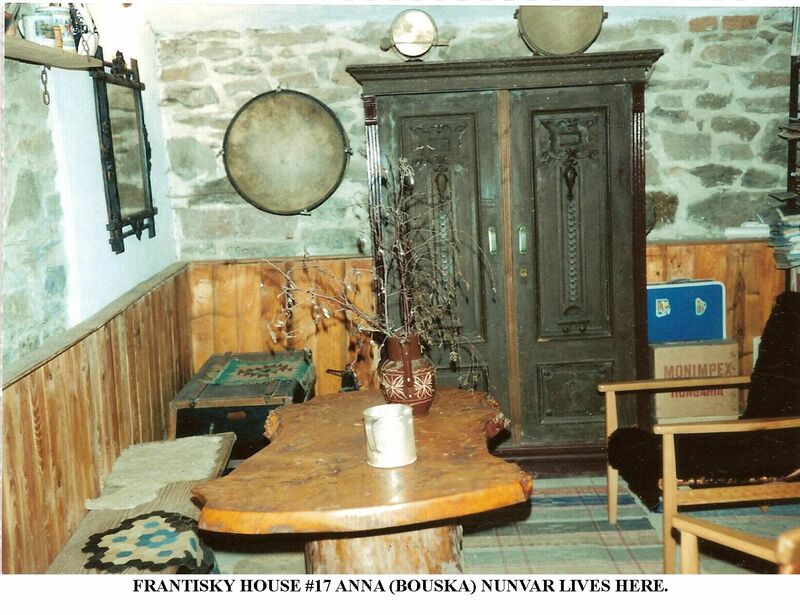 Frantisky House #35 Bouska-Nunvar home; FRANTISEK BOUSKA AND HIS WIFE, ANNA NUNVAR MOVED TO HOUSE #35. 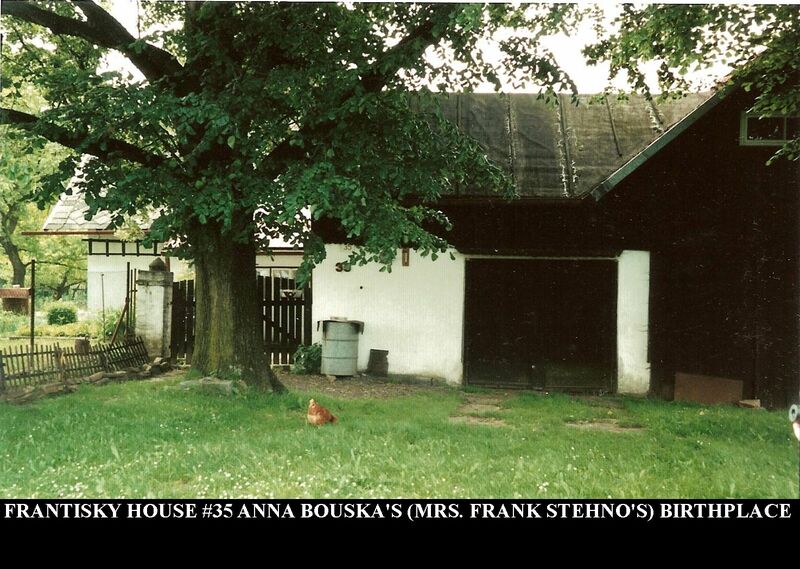 THEIR DAUGHTER, ANNA BOUSKA (MRS. FRANK STEHNO), WAS BORN IN THIS HOUSE ON 9 MAY 1829. 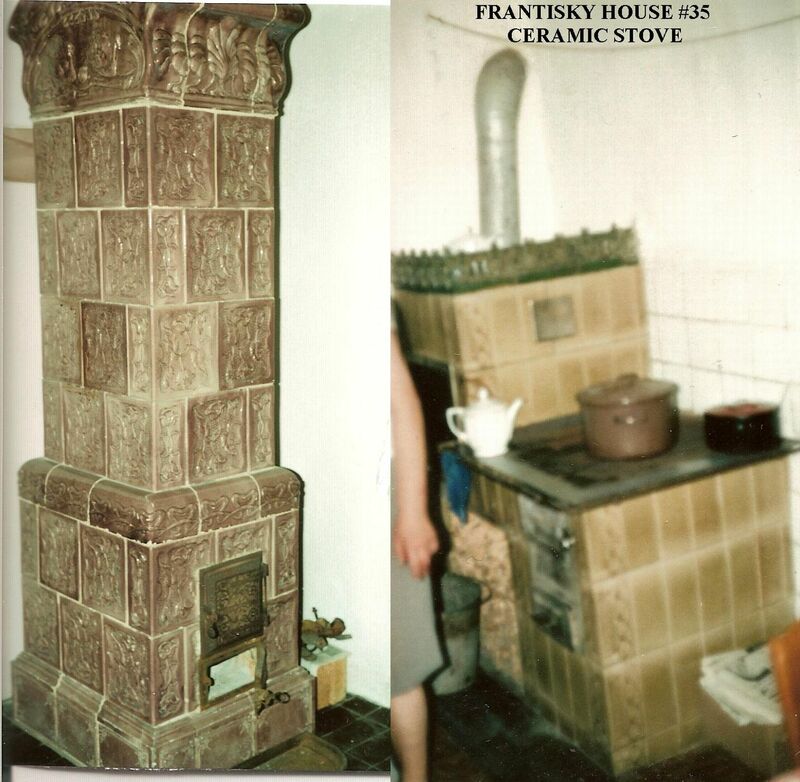 BELOW ARE PHOTOS OF FRANTISKY HOUSE #68, BIRTHPLACE OF FRANTISEK BOUSKA -in 1796. We also saw the church where Bouska ancestors were christened and two cemeteries where some were buried. The Frantisky village belonged to thePusta Kamenice parish church. Bilek is where Grandfather Ludvig Stehno was born. Took pictures of house #49. Visited with the man living there now. He has restored it. His granddaughter and two other little girls were there. One of the girls spoke a little English. She was with two other girls who picked a bouquet of flowers for us. The gentleman gave Jean original papers that showed ownership of the house. 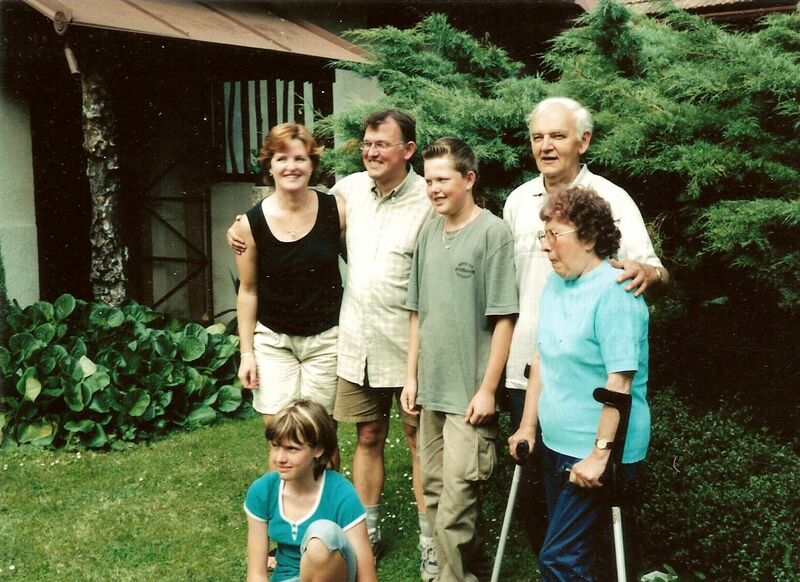 ABOVE PHOTO OF THE KILIAN FAMILY, MILADA (STEHNO) KILIANOVA ON CRUTCHES, HER HUSBAND, JOSEPH KILIAN, THEIR SON JUNIOR AND HIS WIFE MARY, AND THEIR GRANDHILDREN ANDREW AND PAVLA. Next, we went to (Marieves) Prijemky where we visited the Kilian family. 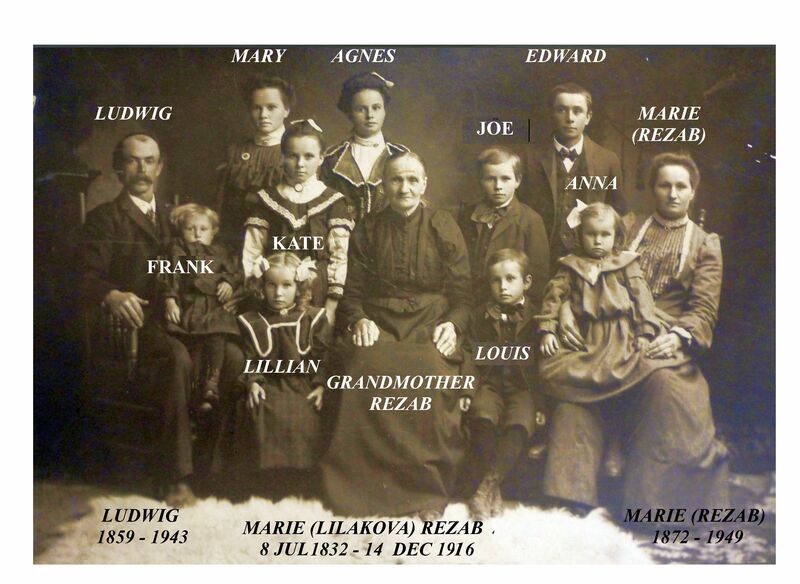 They are Stehno descendants of a Frantisek Stehno (not our ancestor Frantisek Stehno born in 1808) who married Anna Patek, Milada’s grandparents, all dates unknown. 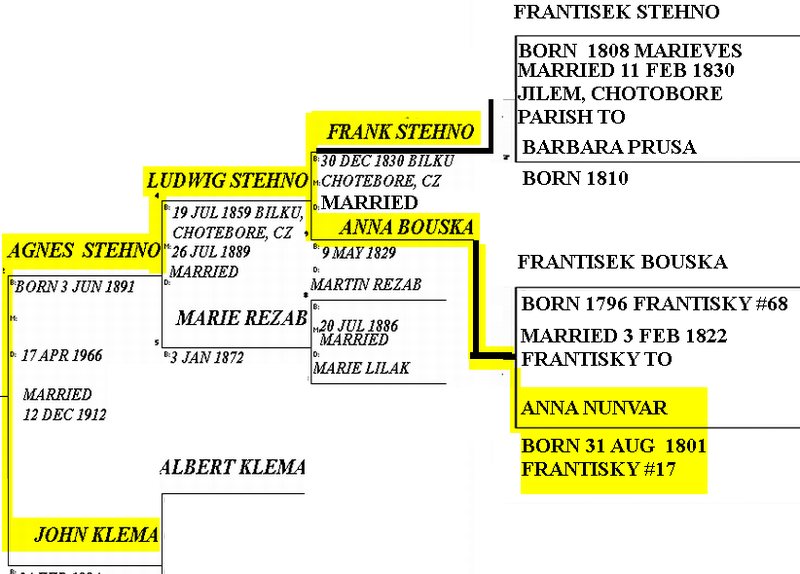 Frantisek and Anna’s daughter, Anna Stehno is Milada’s mother. 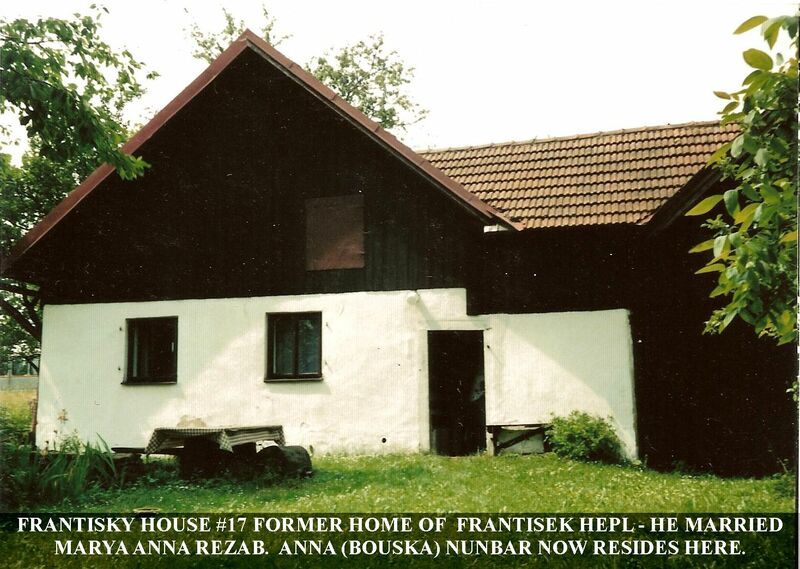 The Kilians live on the original birthplace and home site of the of our ancestor, Frantisek Stehno, born 1808 in house #15. House #15 burned, but the relatives rebuilt it and the new house is now #11. MIlada Kilianova is our Stehno relative. Her husband’s name is Josef Kilian. They have a son, daughter-in-law, Mary who speaks a little English and children Andy and Paula. These are the American names. They knew we were coming and had open faced sandwiches and cold drinks for us. Malada was recovering from foot surgery after breaking her heel. Josef Zoefl and the rest of us returned in the van back to Prague. Dinner that night was at a local restaurant Staroprazska restaurace. This was a free day for some, while others went on a trip to the villages. Dwayne and Shirley went with Pep and Jean on the subway down to the square. We shopped along the way and walked to the Karly Most (St Charles) bridge, which is the most famous bridge in Prague. There were many venders on the bridge selling their wares and it was quite crowded. On the way back we had a light lunch at one of the restaurants. We sat on the street and listened to a large band play while we ate. Ivan, Ona and Larry visited Busin, the village of the Klemas, and Hosterlitz (Hostice) village of the Vejnos family (Albert Klema’s wife’s family), via the town of Litomysl, where we stayed on Friday night with our guide and interpreter, Joseph Zoefl. We met the Cikryt family, Milan, Martina, Ludmila and Antonin. Antonin is a (great?) nephew of Stepanka Klemova. 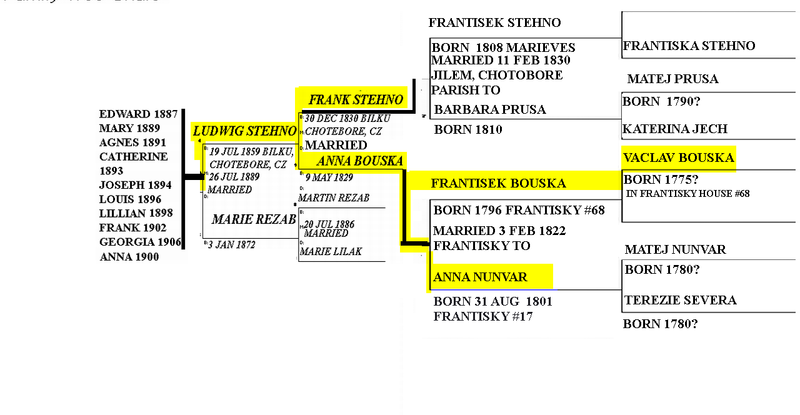 Stepanka is Antonin’s grandmother Hedvika (Klemova) Janku are sisters. See family tree below. We were invited to enter the ancestral home, which was vacant and planned to be torn down. 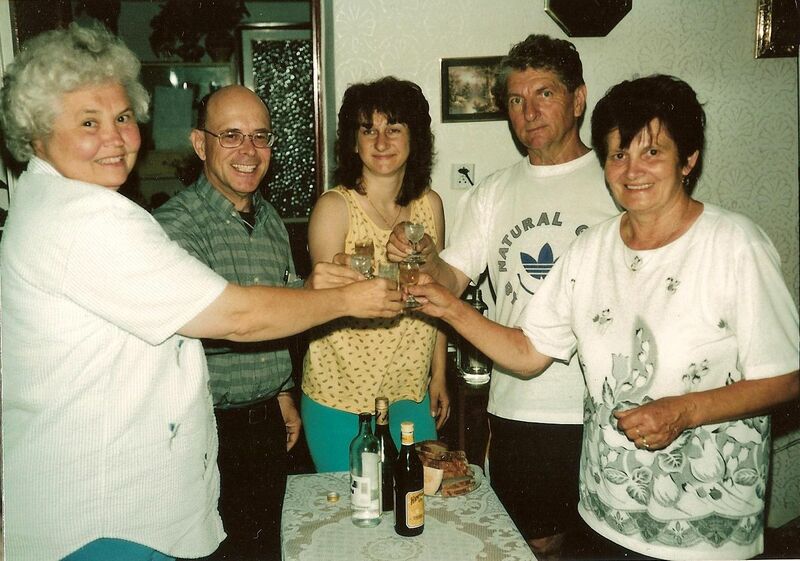 Then we went to Antonin and Ludmila’s home to look at some old photographs, drink plum brandy and eat sausages. I presented them with the greeting card that was signed by those attending the Klema reunion a few weeks age at Wilson. Also I showed them pictures of the Klema reunion. 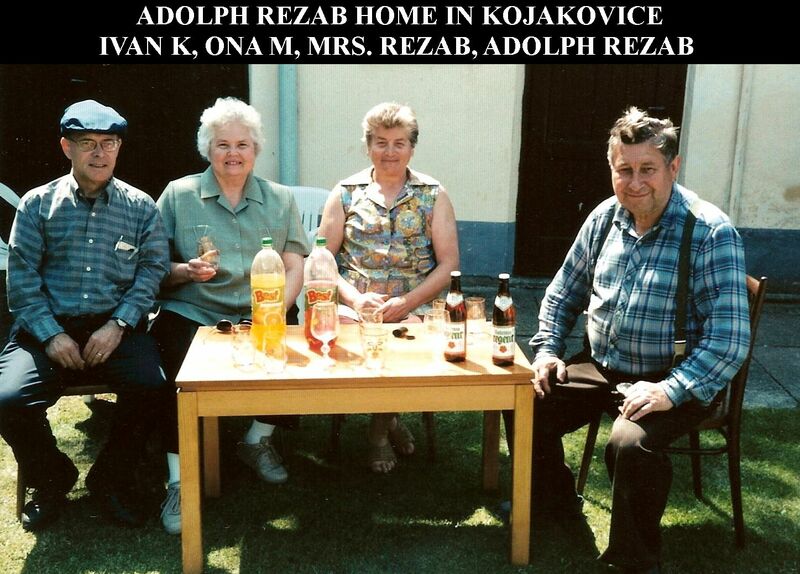 Their old photographs had no names, but I recognized the Vejnos’ family in the pictures. Also they had pictures taken in Wilson, Kansas, but they had no idea who the people were. We labeled as many of the pictures for them as we could, and promised to send more information to them as we identified persons in the pictures. Ona took pictures of the old photographs with her digital camera. It was around noon, and we had to leave. 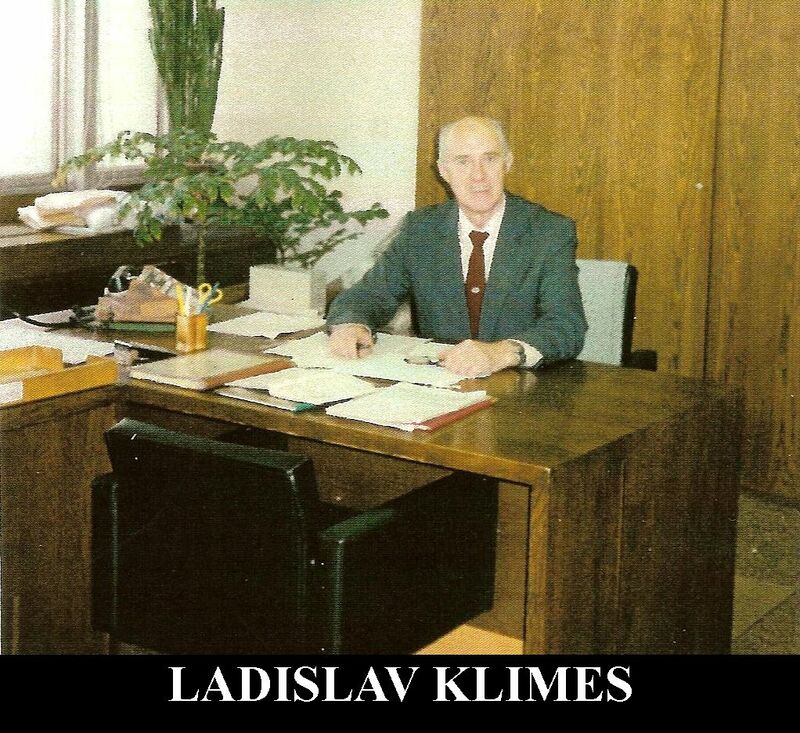 Near the end of our visit, a letter was given to us written by a Ladislav Klimes, a retired animal fiber merchant, living south of Prague. He invited us to call him. He is related to Stepanka Klemova, who he refers to as his aunt. Although I had written the Mayor of Busin. We did not have time to meet him. Upon my return to Kansas I found he had sent me a letter with two pictures of Busin, and indicated he was looking forward to our visit. 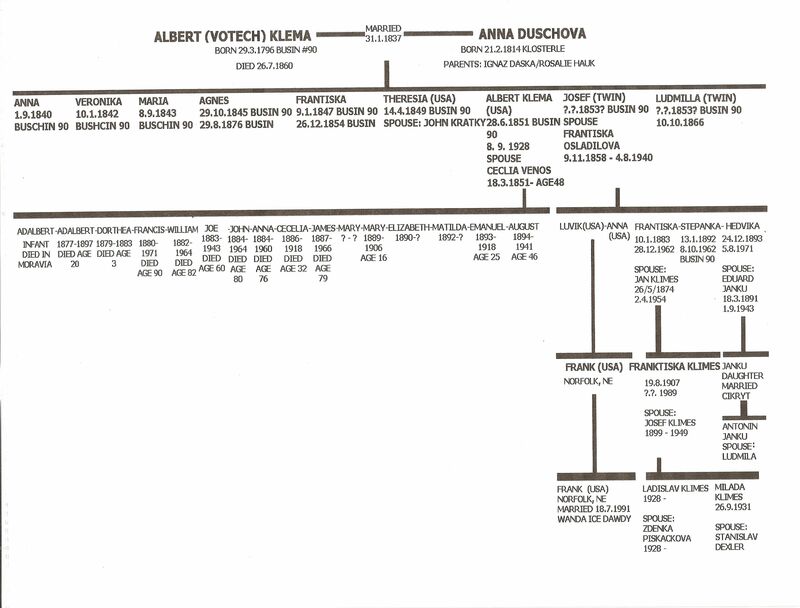 This is the Klema family tree. CLICK TO ENLARGE. See family tree. These are the grave stones of Stepanka Klemova, the last resident of House #90, and Hedvika (Klemova) Janku, whose daughter married a Cykryt, and their son, Antonine Cykryt, we visited in Busin. He owns the Klema ancestral home #90. We took a quick trip through the villages of Hostice and Hrabenov, and then headed for Prague. 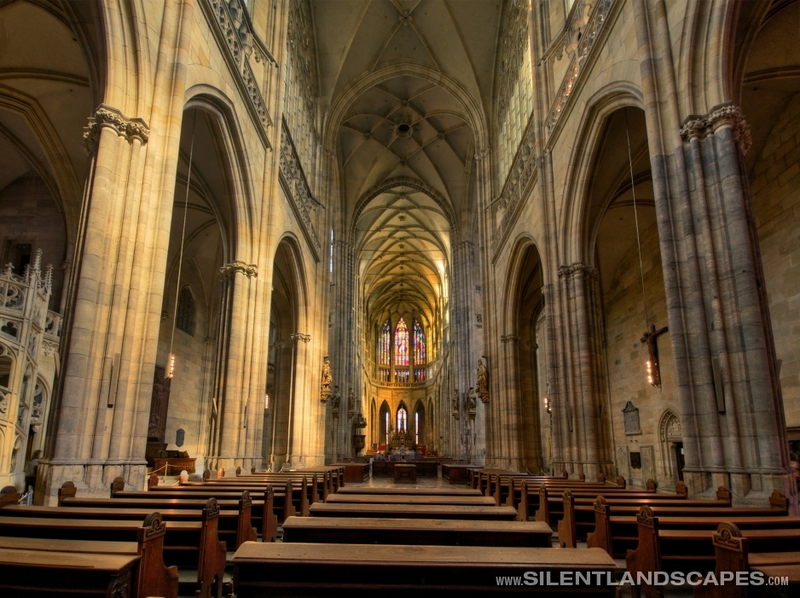 On the way to Prague, we made a quick stop at Kutna Hora, and took pictures of the great cathedral of St. Barbara. The church has three steeples and flying buttresses. 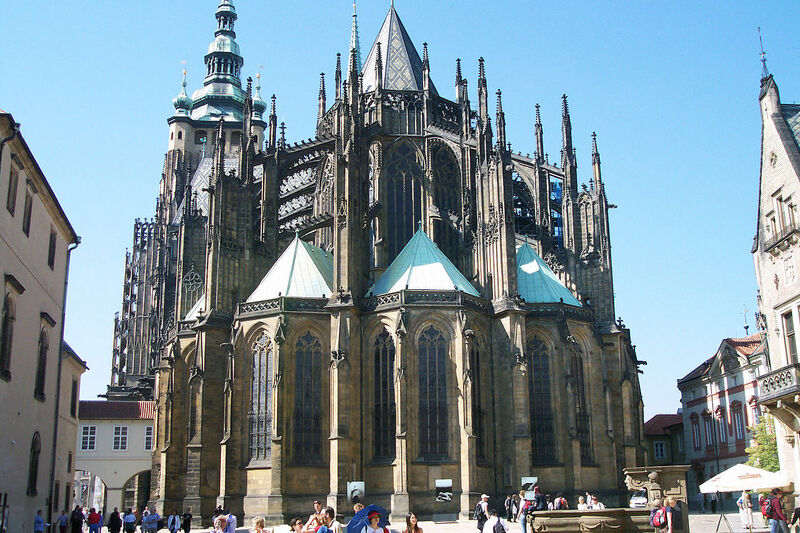 It was constructed by Peter Parler who constructed St. Vitus cathedral in Prague. The farewell dinner that night was at the restaurant U Pelikana. Live music was provided that included dancers, singers, and musicians. Jana took us by bus to the airport. All went their separate directions. Ivan Dwayne and Shirley were together again on the return trip to the US. On the flight from Prague to NY, I was seated next to a blonde Russian, about 25 to 30 years old, by the name of Svetlana Mariochienschenko. She was from the Ukraine. We conversed about life in the USSR under communism. For her , life under communism, was very good. Her family lived very well, but now under capitalism, conditions are worse. But she was optimistic for the future. She planned to visit the US and work in Harrisburg Pennsylvania. She had a folder indicating she was involved with the foreign exchange student program, but when I questioned her about her student status, she said she had a G1 visa but was vague about her intent to study in the US. She had missionary friends, from Tulsa, whom she met in Russia. They were involved with an orphanage in Russia. She also asked for help locating a man who had not written his 80 year old mother in Russia for 5 years. She said he had joined a ‘church,’ in the US and there has been no more contact with him. She took my e-mail address and promised to send me more information about him, after I offered to help her locate him. I told her that if he had joined a cult, it would be almost impossible to locate him, and he would probably not respond to any letters delivered to him by his mother, if he was involved in certain cults. She was very teary eyed when I left the plane. She said she was nervous about being processed through US customs and immigration in NY. We arrived in KCI about 11:30. This entry was posted on December 21, 2008 at 11:16 pm and is filed under Travel. You can follow any responses to this entry through the RSS 2.0 feed. You can leave a response, or trackback from your own site. Very nice page you have put together about your trip. I believe that I ran across Ludwig Stehno’s old home in Ellsworth County, south east of Wilson, Kansas. Here is a link to the photo on my Facebook page. I was wondering if there are any photos of the homestead when Ludwing and his wife Marie lived there? If there are I would enjoy seeing them, if you wanted to share them.